My very first concert was a Brooks & Dunn concert. I don't remember much of it - I remember Lonestar opened for them and did a pretty solid job, and that Brooks & Dunn really had a lot of flashy fireworks in their show - but the duo left on an impression on me growing up. When I was listening to 90s country, I listened to a lot of Brooks & Dunn, and looking back on them now, I'm not surprised why they did so well. Kix Brooks had the smoother tones to bring in a more pop audience, and Ronnie Dunn had the rougher, more 'country' vocals to appeal to mainstream country fans. That said, as much great line-dancing music as they made, they were never critical darlings, mostly because they weren't exactly deep songwriters before they subsumed to the Nashville songwriting machine. And as much as I like the band for making some 90s country standards, you didn't go to Brooks & Dunn for depth in mainstream country, you had Alan Jackson and George Strait for that. And thus, when Brooks & Dunn split up after two decades of music, I wasn't that fazed. What did interest me was Ronnie Dunn's continued solo career, which he kicked off in 2011 with a self-titled album and is most remembered by me with 'Cost Of Livin'', a brutally tragic song about the continued recession across the United States, especially in rural states and small towns. It was a daring move for a second single, and what makes the song so powerful is that it doesn't present a solution or a message that it's all going to be okay. That song, combined with some vitriolic remarks against the evolving state of modern country, did have me curious about his newest album, albeit with a certain degree of caution. After all, I appreciate steps in a more mature or deep direction, but I'm also aware those comments can be used to placate country music press concerned with authenticity from examining your material. So, what does Ronnie Dunn deliver? Ugh, this is one of the tricky ones. Make no mistake, Ronnie Dunn's Peace, Love, and Country Music is a boldly conceived effort with many highlights and a lot more experimentation than you typically see in mainstream or neotraditional country music. The closest analogue I'd make this year is Eric Church's album The Outsiders - and just like that album, I get the depressing feeling it works better in pieces than it does as a whole. And while I like Ronnie Dunn's second solo album more than Eric Church's trainwreck, it suffers from many of the exact same problems that make it hard to really recommend. So let's start with Ronnie Dunn himself, who both as a songwriter and performer can be defined by two words: direct and broad. To be blunt, Ronnie Dunn works best in bold, stark songs where he can let his rich, textured voice carry the emotional resonance, and on the better songs of this album, he can do just that. He's not subtle by any stretch of the mind in his delivery, which does mean a few songs on this album don't work as well as they could, but when he goes for broke, he's an effective and consistent presence across a number of songs. I just wish the rest of the album had any sense of consistency, because the production quality is all over the place. For a few songs we get snippets of beautifully textured and steel guitar-filled neotraditional country, with Dunn's Baptist roots shining through in the always welcome organ. These songs are the most familiar and consistently strong tracks, but at the same time, they never really rise to being just good songs. Where things get interesting are the steps Ronnie Dunn takes towards a harsher, grimier Southern rock direction, with crunchier guitars, thicker distortion, and a borderline metal presentation. Hell, there are harsher and more textured guitar tones on this record than I've heard on some metal records this year! This leads to one of two highlights on the record for me in 'Thou Shalt Not', a song that embraces a Southern gothic with a sleazy lo-fi electric guitar tone, hollow percussion, and ominously sampled bass backing vocals with phenomenal production. On the other hand, you get songs like 'Cowgirls Rock 'N Roll' and 'Country This', which might have meaty guitars with explosive presence, but they also add more electronic effects, chintzy backing vocals, and only amp up the meat-headed sensibility of the songs. And it's really the electronic effects that hamper the other area of experimentation, and that's Ronnie Dunn's steps towards mainstream country, with pluckier guitars and more airy, sweeping production. But the last thing he needs is drum machines and Autotune, as they completely don't fit his defiantly organic vocals and make songs like 'Kiss You There' and 'Let's Get The Beer Joint Rockin' stand out as bad checklist bro-country tracks. It's telling the best of the mainstream country songs on this album is 'Cadillac Bound', and it features the cleanest production. Now, granted, that song also works because it's a straightforward powerful love song in the vein of 'Born To Run', and this takes us to lyrics and themes. As I said, Ronnie Dunn is straightforward and direct, so songs like this, the opener 'Grown Damn Man', the surprisingly sincere 'You Should See You Now', 'Heart Letting Go', and the title track are decidedly country songwriting that works just fine. Hell, 'Thou Shalt Not' plays up the religious outlaw angle in the lyrics and the straightforward presentation works very well. Unfortunately, there are songs on this record that require a little more nuance to effectively pull off. Take 'I Wish I Still Smoked', a solid neotraditional country ballad in the vein of Alan Jackson's 'Everything I Love', where Ronnie Dunn reminisces about his adventurous days filled with bad habits - and then he straightforwardly tells us in the chorus why he misses them and lays out his rationale, which he didn't have to do. Or take 'Romeo And Juliet', a song about a failing relationship with some good lyrics, but operates on the premise that he wants that same feelings of young love like Romeo and Juliet - a pair of lovers whose naivete and heady infatuation got them both killed. Or take 'You Don't Know Me', which with the organ accompaniment might just be the most melodramatic song about being stuck in the 'friend zone' I've ever heard, and it's far from flattering. Or take 'Country This', which seems to be trying to condemn the city country establishment for co-opting the brand - but then he delivers one of the most processed and flatly performed country rock tracks that could have been churned out by that same establishment. This points to the biggest issue with this record: for as much as Ronnie Dunn has condemned the commercialization of country music, his hypocrisy is pretty obvious when he has songs that seem tailor-made for mainstream radio, especially since they're his lead singles. And it gets worse when you have songs like 'They Still Play Country Music In Texas' - and on its own, the song works and I can even empathize, as my current favourite country record of the year is Texas country. But when you condemn Nashville's songwriting machine while having songs that play with the same formula, or you condemn metal tones in country music while having some of the most defiantly hard and textured edges in your music, the song loses all of its weight. And what's worse is that I liked the southern rock and metal edges to this album: they had texture and meat and showed a side of Ronnie Dunn's music that you don't often see in modern country, so why condemn the elements that made your music stand out? Ugh, look, this album is a complete mess that's not without merit, but really doesn't work as a whole. I can accept that Ronnie Dunn put this together on his own label and did it all outside of the country establishment - which I respect, and does yield some interesting and pretty damn good material - but at the same time, there's no self-awareness here, and that really hurts the overall feel of the album. So I'm giving it a 6/10, because there are elements that stand out well, but not enough to really elevate this record into something special. 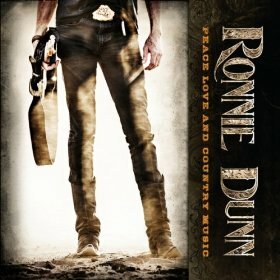 If you're interested in hearing a more experimental country record with a unique flavour from an old pro in the business, check out Peace, Love, and Country Music by Ronnie Dunn - it doesn't all work, but the parts that do are worth the listen.